Physicians are, by nature, lifelong learners. We are inquisitive. We know that only by keeping up with the latest developments can our patients receive the very best care possible. It is this commitment to lifelong learning that the American Board of Internal Medicine’s (ABIM) Maintenance of Certification (MOC) program is intended to support. We know that many doctors appreciate a formal process to help them keep up—provided it is meaningful and relevant to their work. We also know from system leaders and patient advocates that a recognition system for doctors who participate in MOC distinguishes these doctors to their patients, peers and the medical community writ large. Participation in MOC should serve as a source of pride and accomplishment. In late 2012, we implemented the American Board of Medical Specialties’ public reporting standards and began reporting on ABIM’s website whether or not physicians were “meeting MOC requirements.” Some doctors criticized the website reporting for being confusing or demeaning – confusing because physicians with grandfathered certificates don’t have to participate in MOC to remain certified, or demeaning because instead of acknowledging that physicians participate in MOC as a demonstration of their professionalism, the language framed it merely as meeting a set of requirements. We have taken these concerns to heart. That’s why a few months ago, the ABIM Directors and I announced that we would change the website language from “meeting MOC requirements” to “participating in MOC.” Today, if you check ABIM.org, you will see these changes have been made. To me, the change of these three words is important. It underscores a sense of pride that many in the profession hold for lifelong learning. It also demonstrates that ABIM is sincerely committed to listening to the feedback of physicians and implementing changes. ABIM is not done listening or changing; we are just getting started. 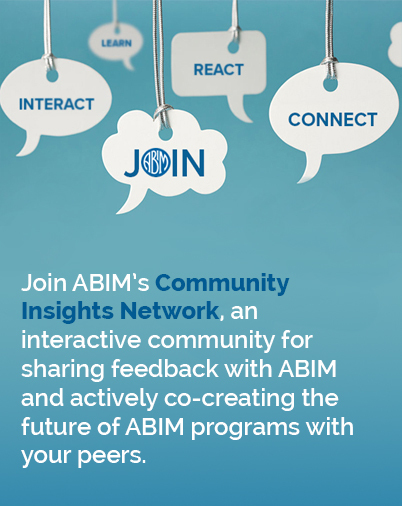 Over the coming months, I hope that you will share your thoughts and feedback with me so that ABIM and its programs can continue to help you in your pursuit of lifelong learning. Please e-mail your thoughts to me directly at rbaronmd@abim.org.